​​​​HOUSTON – The 2017 outlook for the city's retail market looks healthy, reports Colliers International in its first-quarter market update. The firm said that even though Houston lost about 80,000 high-income jobs between 2014 and 2016, retail market indicators show no signs of a struggling economy. About 68 percent of the retail space under construction at the close of the first quarter was preleased. Despite the 1.5 million sf of new inventory delivered in the first quarter, Houston’s average retail vacancy rate remains low at 5.6 percent. 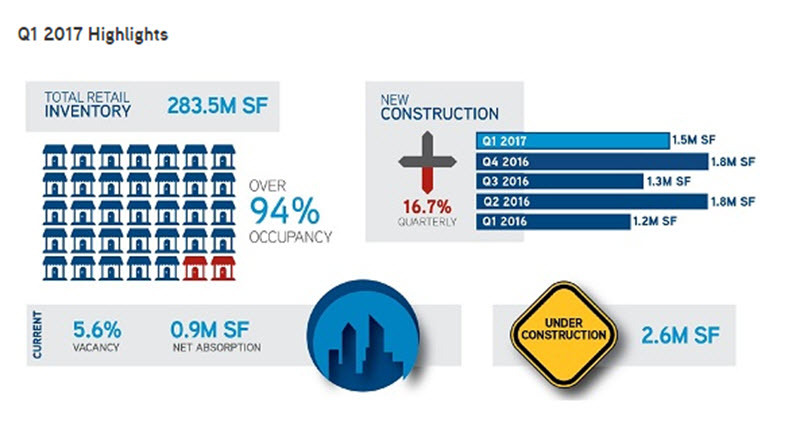 Local retail leasing activity, which includes renewals, decreased from 1.6 million sf in fourth quarter 2016 to 1.1 million sf in first quarter 2017. Most of the Class A space inside the city limits is 90 to 100 percent leased.